Sally-anne Kellaway is a contracting sound designer and consultant for the video games industry. Working closely with the Industry-standard Audio Middleware solution FMOD, she develops the FMOD Studio Video Tutorials, manages the FMOD Help and Hints group and runs workshops and lectures at major conferences worldwide. 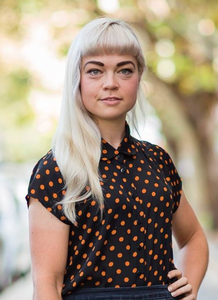 Sally is also the Sales and Marketing Co-ordinator for The Sound Librarian, where she is developing the relationship between industry tools and education at the tertiary level with an interest to better prepare students for the games industry. Sally started her career with SEGA Studios Australia, working across the Motion Capture, Animation and Audio departments and developing a strong appreciation for cross-discipline co-operation and a taste for using adaptive game audio to augment true-to-life scenes. Following the completion of her employment with SEGA, she went on to complete a Masters in Design Science with a specialisation in Audio and Acoustics and develop her knowledge for spatial audio in direct application to HRTF technology. Part of her passion for the industry lies in mobilising all sound designers to apply their skills through implementation in middleware. Her work with FMOD allows her to reach out to her peers and encourage them to challenge their perceptions about what audio for games could and should be.